As my kids get older, I'm trying to make the holidays more magical! I remember Easter when I was younger, my mom would write us a note from the Easter bunny. the note would give use directions on what we would need to do or go to get our Easter baskets. It was so exciting as a child and I hope I could live up to what my mother use to do. 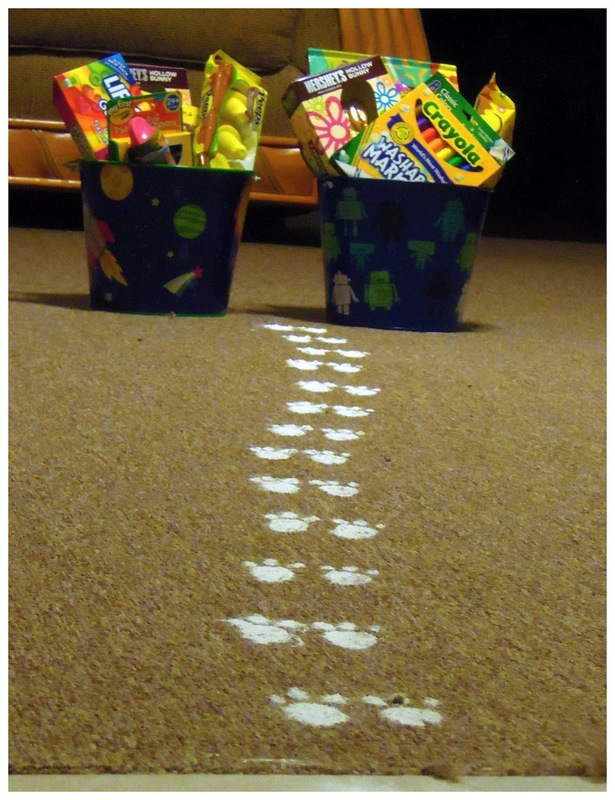 So this year I found on Pinterest how to make bunny prints with baby power. And this is what we came up with! Jeff the artist that he is, helped me draw and cut out the prints. he brought the kids up to bed and I did my magic. I couldn't wait for the boys to wake up and see what the bunny was up too. the first couple of minutes they didn't even see what they got for Easter they were just enjoying and investigating the prints. i was a happy momma. Another reason why I loved holidays as a kid, I loved being able to eat a ton of candy. So that's what we did Chocolate covered peeps before breakfast...why not! After Jeff got done with work my parents set up an Easter egg hunt for us! Noah was not thrilled at first! Aunt Kaitlin was a huge help! one thing I love about Kaitlin is every day has to be a fashion show and she was a sight to see her walking in the field in her 6 inch heel-less heals and mini dress following Jude around collecting the eggs. she looked fabulous like she always does. there it is again that little finger pointing in excitement! the Easter egg hunt was successful! I hope that this will be a tradition in our family, not only with my kids but with my future nieces and nephews. I love being together for the holidays. the only thing that would have made the day complete was to have Dannielle home. I truly wish that she lived closer. it makes me sad to think she misses the holidays and seeing my boys grow up. and when she has kids i don't want to miss them growing up. i hope that the future will bring her closer to home. once we got home we spent some time relaxing as a family. read a couple of stories to my boys. i love how quiet and calm they become once i hope the book and start to read. and i never knew that Jude looked at me when i read i love that little face. but in all Easter was a great day filled with magic, family and food!